This past weekend we went to Picton to visit with some friends who were travelling through on a Royal Caribbean cruise. Alice and Celia had never been on holiday before, at least not with us, so we weren’t entirely sure how they would go. They had the best holiday ever! In planning for the trip, even for one night with the doglets, took a little more planning. First up was booking some accommodation. 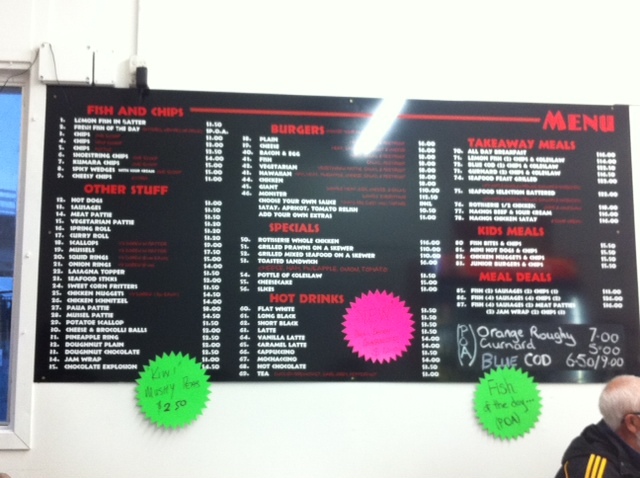 We decided to stay in Blenheim as it’s a much larger town than Picton, so gave us more options. A google search for pet friendly motels didn’t give a lot of options and some considered they were pet friendly, but dogs weren’t allowed inside. I don’t consider this pet friendly. I want my dogs having the same level of comfort as they have at home, they shouldn’t have to sleep in the car. I found Bella Vista Motel in Blenheim had listed pet friendly by arrangement. A quick email to them and we were booked in a triple room (queen + single) for $155. I often stay with the Bella Vista chain and I recommend them very highly – I have never had a bad experience with them! Our road trip to Blenheim was uneventful. 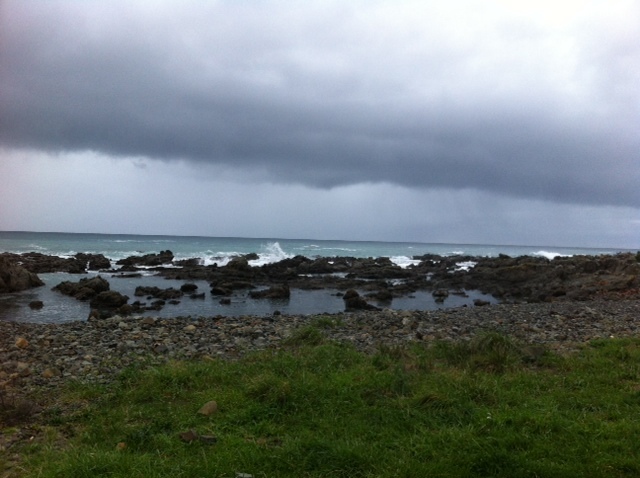 We stopped at Waimate for a wee (us and the doglets) and then again at Kaikoura for lunch. 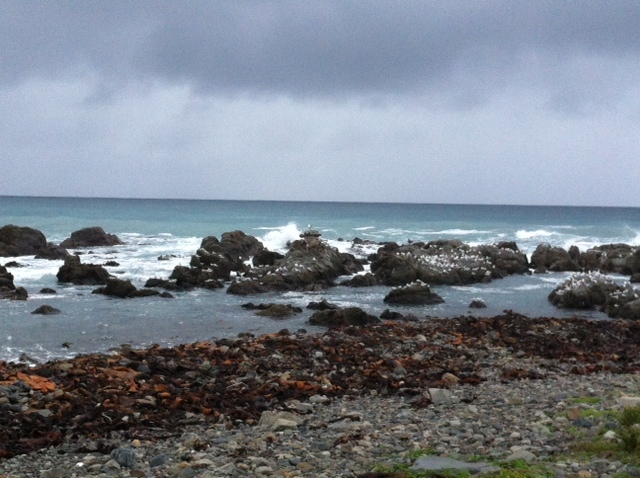 We grabbed a takeaway lunch at a bakery and then went to the main beach at Kaikoura by the railway station for a quick walk with the dogs. It’s a shingle beach and as the weather was drizzly, fairly deserted. Alice and Celia had a blast! They just loved the freedom of being off their leads and it was nice to be able to walk them in such a beautiful environment. It turned from drizzle to rain as we walked so we headed back to the car and headed off to Blenheim. We arrived to the Bella Vista and checked in. We were quickly pointed towards the river which has a very nice walking path and lots of people walk their dogs there. We walked there once on Saturday afternoon and again on Sunday morning before heading to Picton. The dogs enjoyed their overnight, Alice slept on the bed with us and Celia claimed the armchair which we covered with a blanket from the car. Alice was a little distressed by the noise of the neighbours coming back late but soon settled. In Blenheim the main shopping area does not permit dogs at all – so it’s not a good choice at all for taking your dog on holiday. This wasn’t an issue for us seeing we were just passing through though. On Sunday we made the quick drive to Picton to meet our friends. OMG was it cold! On and off drizzling and a freezing, strong wind. We were walking around before the ship came and didn’t see the “dogs on leads” sign, we had them walking off lead. A man from the aquarium said that they need to be on leads – we were glad he pointed it out but we had honestly not seen the signs. We stopped and chatted for a bit and he was very helpful and gave a number of recommendations for dog friendly places to try for lunch. He said we would be welcome back to the Aquarium as the dogs could wait in the foyer area. Next stop was the information centre, as we wondered what options we had for keeping warm with our friends when they arrived off the ship. The women in the i-Site could not have been more welcoming. “Yes, please come inside and bring your dogs in with you“. Celia and Alice had a lot of attention and we hung out for a short while to keep warm inside. The buses started to arrive from the ship. We went to wait near the museum where they were dropping off the passengers. Alice and Celia were part of the “Welcome to New Zealand” committee. Lots of pats were received by the tourists arriving. Even a few photos were taken. Our friends arrived and we headed to a nearby cafe recommended as “dog friendly” by the man from the aquarium. We asked and were told we could bring them in, and were pointed to a bar area at the back. It was so warm inside and they were tired so after a few cuddles with our friends, Alice and Celia snuggled down on laps to sleep while we ordered our food and drinks. Our meals arrived and the waitress said “you can’t have dogs in here“, we explained that we were told we could. Some other people at a nearby table also had a dog too. She went away presumably to speak to someone and never came back. I am not sure what the rules are around dogs in cafes/bars so I won’t name the place here in case I get them in trouble, but I will definitely go back next time I am in Picton – dogs or no dogs. It wasn’t like they were on the table or eating off our plates, if you didn’t come right up to us, you wouldn’t have known they were there. After lunch we had a bit of a walk around the shops then said goodbye to our friends to start our long trip back home. 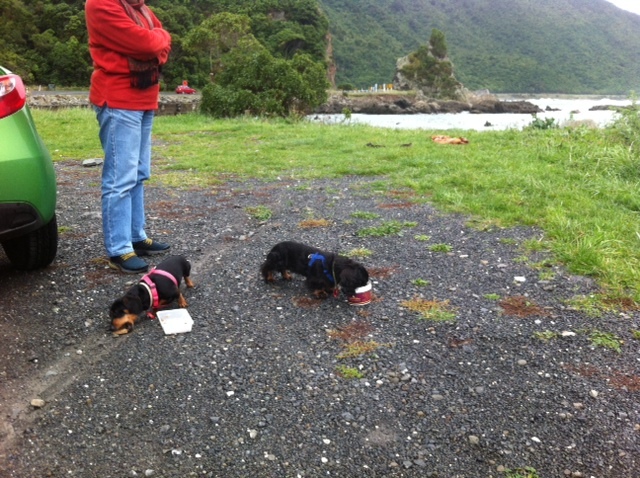 We stopped at Kaikoura for dinner, takeaways at the fish’n’chip shop and the dogs enjoyed dining alfresco by the beach. I’m looking forward to “holidaying” with them again. They really enjoyed the new experiences and were so easy to travel with. If your dog is particular about its bed you may like to bring that along too.